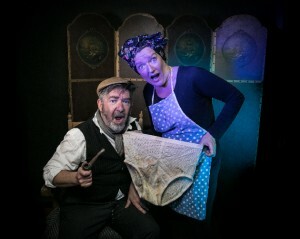 Audience members at The Palace, 2016 were very enthusiastic in their feedback from, ‘Oh my god my sides hurt, that was the best Christmas show I’ve ever seen’, to, ‘You MUST GET A ticket for this show if you can !!! Comic genius in our town ! !’ High praise indeed. And, not content to have just one Christmas show on the go, Kate Tym and John Knowles are are also the writing team behind this year’s brand new, professional panto at The Rye Creative Centre, Jack and The Beanstalk. ‘We can’t give too much away about this,’ the pair say, ‘but anyone who knows our work won’t be surprised that we have managed to mix the traditional (local historical characters like the Giant of Brede and the Biddenden Maids) with a modern take on Jack and her love of guitars! It’s been a lot of fun writing this panto and weaving together the old and the new, as well as creating a whole host of lovable local characters. It’s classic Panto with a twist. And,’ John comments, ‘you can get a family ticket for both shows and still pay less than an outing to see Honey G!’ Now that really will make for a very merry Christmas! « Inside Out: What goes on in the Museum?